Another newbie, another tree, another identification. 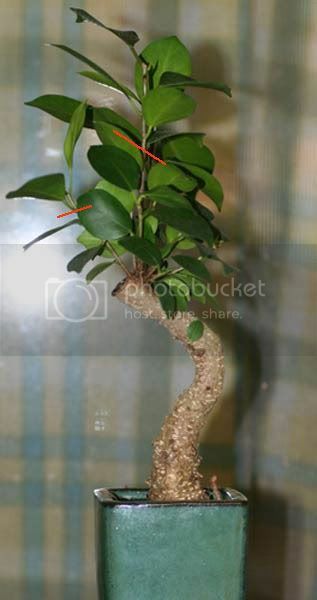 I believe it may be a Ficus, but I want to make sure so I know how to take care of it. SF - I believe you have the Ficus retusa aka Tiger-bark fig. It's one of the figs which develop a roughness along the trunk. It makes wonderful bonsai material and is very forgiving - good for newbies. It adapts well to bonsai culture, backbudding very well, responds to defoliation when done properly, and grows well indoors. They flower and bear fruit in late summer. Beware - nothing is perfect. This tree can quickly be infested with scale insects. Keep a watchful eye. Thanks, Tom! Now I'm absolutely sure. I'm really looking forward to working with this little guy. StickFish, I really like the curvature or 'movement' in the trunk of your tree. It speaks of age, decades of wind. stress, the elements. Nice way to start out a new 'bonsai'. Can you post a better profile picture - from the front. Looks like a nice one. I'll start working on a picture now. The tree came like this when I got it. I think my only possible complaint would be that at the top of the curve, the tree got chopped by where the new twigs come out. I think if it had been grown out into a curve, it would have made a nice cascade. But, then again, a bonsai could be anything. I just need to find what this one could be. Alright, got some photos taken and edited. I would suggest a wide flat training pot. The tall thin cascade pot is not right. For one thing it will be very top heavy - out of balance in no time. Expose the nebari a bit. What you have is a very nice ficus, and soon the chop problem will be much less noticeable. a new leader will grow out and ready for some training. I agree with Tom, a wide, flat pot would look nicer. Don't worry too much about the cut area at the top. Once you have more branches and get some ramification going you will be able to hide that area. Nice little ficus. I have a couple I work with and they are fast growers. Here is my first quick impression of where I would prune it. It would force the branching out lower, near the trunk. Just my thoughts on the subject. I've been thinking about how I want to begin training all my trees. I think I'll be moving them into larger containers for a couple years to help grow them out more. Tom, when you say "expose the nebari", what do you mean? Uncover the bottom of the trunk so the tree sits higher in the soil? Or just give it more room for the roots to grow? Thanks for the tips, Marsman. I've been trying to figure out what kind of pruning it needs... once I figure out how to properly prune a tree, that's the treatment the ficus will get. "It has a beginning but no end. A bud today becomes a branch tomorrow." "Bonsai is not the result: that comes after. Your enjoyment is what is important"
exposing the nebari is to expose the fat trunk above the soil line as much as possible. It's one of the important characters in bonsai. Also if you move this into a larger pot it will get large fast. This tree needs to be minimized, just my thinking.